Yesterday morning, one of Slayer’s founding members Jeff Hanneman (guitar) passed away at the age of 49 due to liver failure. 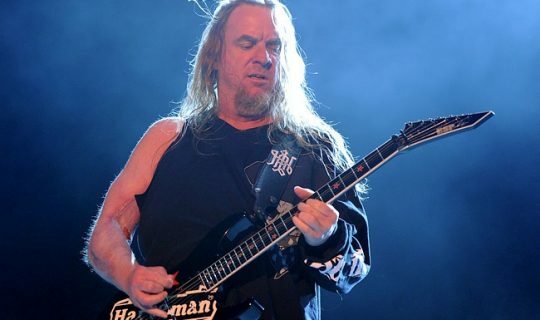 He was responsible for a huge number of iconic Slayer tunes and a huge amount of guitar solos. Slayer are one of the most successful metal bands in the world. Forming in the early 80s and releasing their debut album in 1983 (same year as Metallica’s debut album), Show No Mercy. They released their latest album and Jeff’s final contribution to the band, World Painted Blood in 2010. In 2010 Jeff was bitten by a spider and contracted a flesh eating disease and Exodus guitarist Gary Holt has been filling in for him for a few years. It’s possible now that he may become a full time member as Slayer are still a full time touring band with a new album planned for release this year and tours all over the world. The loss of Jeff Hanneman will not disappear quickly, his guitar sound has been hugely influential on countless metal bands that are around today. RIP Jeff you’ll be missed.